The old-fashioned tea party has become a favorite way to entertain friends or celebrate a special occasion. Whether you decide to have a birthday party for a friend, host a bridal or baby shower tea party, or you just want to host a tea party to get together with your pals, there are some things you need to know. If you're a guest at a tea party that someone else is hosting, congratulations! That person has probably put quite a bit of work into organizing everything, and she thought enough of you to want you there. Once you experience a proper tea, you'll have a hint of a taste of what British royalty has known for centuries. Invitations can be purchased or handmade. If you want your guests to dress up and wear fancy hats, your invitations should reflect it by being more formal than you would send for a come-as-you-are party. For an impromptu party, all you need to do is pick up the phone to invite your guests, but your turnout probably won’t be as good as if you had planned it in advance. You may ask guests to wear decorated hats and bring a favorite teacup. You might decide to have a contest and give a prize for the best hat or prettiest cup. Ideally, the tea should be served from teapots and not with individual teabags in guests’ cups. Heat the teapots by pouring boiling water into them and then pour out the water before making the tea. This prevents the brewing water from cooling off too quickly. It is a good idea to offer a variety of teas. Some of the favorite party teas include Darjeeling, jasmine, peppermint, green tea, and black tea. You may use loose tea with or without tea balls or teabags in the pots. Have a tea station with the different teas on display. It's also nice to have cards with each type that tells a little about it, such as the history, where it comes from, and the benefits if there are any. Offer a variety of teas at the table, and allow the guests to choose after they are seated. Choose one or two types of tea for the party. It's best to use one of the basic teas, such as black tea, and offer a selection of additions. After the tea steeps to the desired strength, it's time to pour it. Most people prefer to start with the milk or cream and pour the tea on top of it. If someone at the table prefers weaker tea, pour theirs first. As you get to the bottom of the teapot, the tea will be stronger as it settles. Start with a clean tablecloth in either white, off-white, or a color that reflects the theme of the party. Lacy or appliqued tablecloths are perfect for tea parties. If your table is round or square, place your teapots in the center, beside a floral centerpiece that is short enough for guests to see each other from across the table. Small creamers and sugar bowls should be scattered around the table, making it easy for guests to reach them. If your table is rectangular, you may place the teapots on both ends, with the creamers and sugar bowls beside them. Each person’s place setting should consist of a teacup, saucer, teaspoon, snack plate, napkin, and whatever utensils they will need for the refreshments. If you are serving snacks at a buffet, you may use this setting, or you may choose to have the snack plates at one end of the buffet line. Food is generally simple because the tea is the central theme and the star of the get-together. Follow basic etiquette rules that you would use for any other party. Ideally, most food served at a tea party can be eaten without utensils. Finger food favorites include scones, muffins, cookies, tea sandwiches, and artisan breads. Break off a bite or two and put a small amount of butter on that. Never butter the entire muffin at once. If clotted cream is offered, that should be added to the scones after the jam. When eating at a tea party, remember that this isn’t a meal designed to fill you up. Take small bites and enjoy the conversation. Sip the tea without gulping. If the tea is too hot to drink, don’t blow on it. Let it rest a few minutes so it can cool off before sipping again. 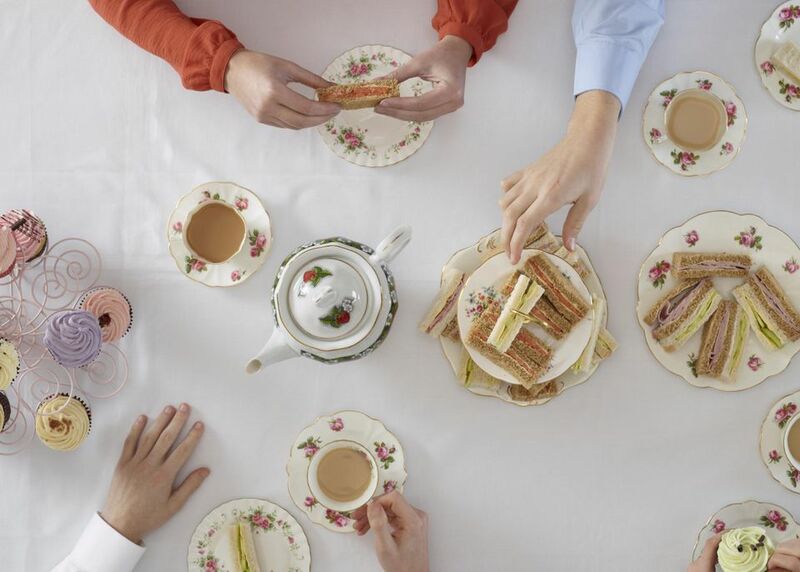 Most tea parties don’t need special entertainment because the conversation will keep guests busy. Have some conversation starters ready, in case they're needed. Everyone can mix and mingle as they sip their favorite teas. Have someone tell the history of tea parties. Have a hat contest with prizes for the prettiest, funniest, or most elegant hats. Most of the time, a floral or other brightly colored dress is appropriate for women and a suit or trousers and jacket are fitting for men who attend a tea party. Women who prefer to wear slacks may do so, as long as they are clean, neat, and nice enough to wear to an office. If the host makes a special request regarding the dress code, honor her wishes. A hostess gift isn’t generally expected for a tea party, but if you choose to bring one, keep it simple. The hostess will appreciate some flavored loose tea, a new tea ball, or a candle. Wrap it or place it in a gift bag and hand it to her as soon as you arrive. If there are place cards on the table, find yours as soon as you get there. You may mix and mingle if the party hasn’t started yet, but it is always a good idea to know where the host wants you to sit. If there is a guest of honor, greet him or her and chat for a moment or two, but back away if there is a line of others wanting to chat. Never put too much food on your plate. Tea party fare isn’t supposed to be a meal; it is a snack. Most of what is served will be finger food. If you spill something, blot it quickly to prevent staining. Let the host or hostess know and offer to pay the cleaning bill. Leave when the party starts to wind down. Always say goodbye to the host and the guest of honor before you leave. Don't forget to thank the host for the event. After you get home, send a thank you note for inviting you and being a good host of the tea party.